Taylor Otwell merged my commits 🙂 Cheers ! Are you looking to contributing to Laravel? Here is the key. Believe me or not there are no support from facebook for themes like myspace and oldie-goldie orkut is having. But still d’t panic as developers have find a way to do so. Today I too created my first theme and made it public. STEP 1: Head on to https://addons.mozilla.org/en-US/firefox/addon/stylish/ and install the stylish plugin for firefox. (if you are having chrome then download stylish plugin for chrome from chrome-store). STEP 2:Move to http://userstyles.org/styles/52416/independence-day and click on “install with stylish” button. from http://userstyles.org/ you can select more themes. this method work only for firefox, chrome and not ie. It is only a user view. that out. I choose only those browsers which are compatible to J2ME/MIDP as (about) all the mobiles sets today have support for Java. I used the top 3 browsers : our favorite opera, the great UC, and featurefull bolt. Most of the mobile browsers work on SERVER-SERVER-CLIENT model, these three giants do so. In SERVER-SERVER-CLIENT model request are made to an ‘intermediate-server’, this ‘intermediate-server’ fetches web-pages (according to request made) then compress them, optimize them and then send these compressed web pages to our mobiles. 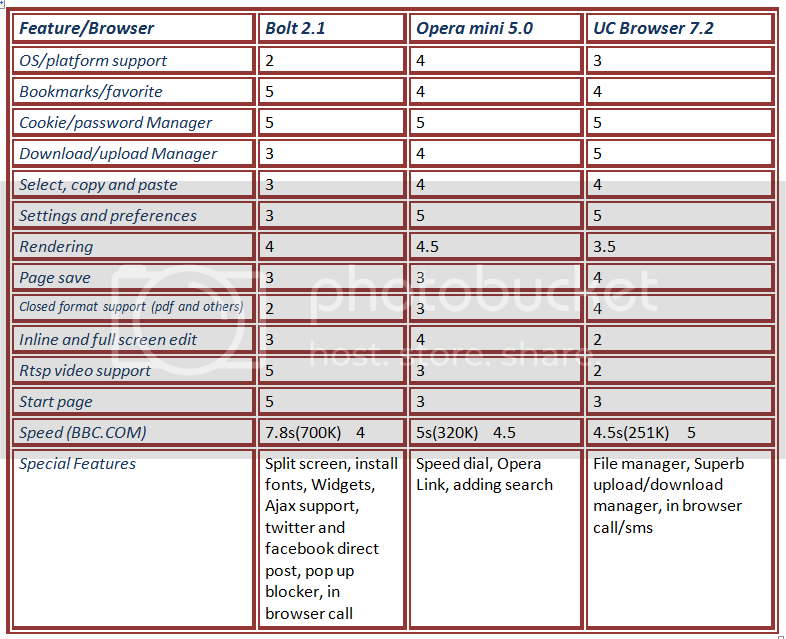 Below is a tabular comparison of various feature of these browsers. Now I think you would be very clear on that which browser suits your needs best.